Brass banding is one of Scotland’s oldest cultural activities, with its roots in the industrial communities of the mid-19th century. The growth of banding led to the formation, in 1895, of the Scottish Brass Band Association (SBBA) which has always been democratically controlled by its member bands. That was also when contesting began, with the aim of raising musical standards. The number of brass bands in Scotland reduced considerably after the Second World War, reaching a plateau by the 1960s, but then a subsequent decline in manufacturing industry, combined with a reduced number of young players entering the movement, led to a steady drop in numbers over the past three decades. With the dawn of the new century, recognition of the earlier decline ensured renewed vigour within SBBA, and the task of reinvigorating brass bands throughout Scotland began in earnest. SBBA’s first seeds for the renaissance of brass banding in Scotland were sown in 2002, with the establishment of a working group to investigate effective strategies for future development. Chief among the Association’s subsequent aims was the appointment of a full-time Development Officer and the implementation of a youth development programme to rival any in the banding world. Working directly with the Scottish Arts Council through the Scottish Government’s Youth Music Initiative, the Development Officer has since facilitated new opportunities for young people in schools to participate in brass bands and improve their musical skills. SBBA’s Youth Development Programme has been behind the creation of more than 20 new youth bands, as well as building bridges between community bands and local education authority instrumental services throughout Scotland. Since 2002, SBBA’s established calendar of events has grown dramatically, including the flagship Scottish Youth Brass Band Championships. 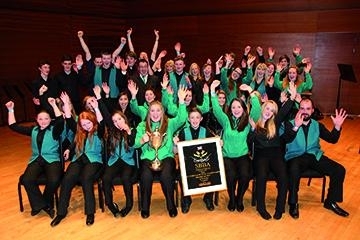 Youth brass banding in Scotland, while still growing, is at an all-time high in terms of participation (52 per cent of the 4,000 players in SBBA’s member bands are under 21), and the standard has always been exceptionally high. West Lothian Schools Brass Band is the most successful youth band in UK history, with 11 National Championship titles to its name, and the National Youth Brass Band of Scotland’s (NYBBS) recent historic tour of Japan is an indication of the type of goals to which young brass players can aspire. One of the aims of SBBA’s Youth Development Programme is to further grow the NYBBS family, and the recent addition of a training band emphasises the desire to involve even the youngest players at national level. By employing techniques such as workshops and masterclasses with leading figures in the worldwide brass community, new generations have been introduced to the long-lasting benefits of brass banding. SBBA has vastly widened its horizons in recent years and now boasts over 100 member bands, of which 20 per cent are youth bands. Having been a male-dominated activity for many years, brass banding in Scotland has also seen a huge growth in female participation, which has now reached 44 per cent. The SBBA also encourages the advent of new ensembles covering all age groups, and the band formed in the Stirlingshire town of Callander is a fine example of the lifelong learning opportunities available through brass banding, blending the enthusiasm of youth with returning veterans and adult learners.